Brittany Bellus modeled for this feature and did her hair and makeup. I wore a few hats and photographed, styled, and wrote the feature. We went with big waves because it was my vision to fill up the shot with hair. 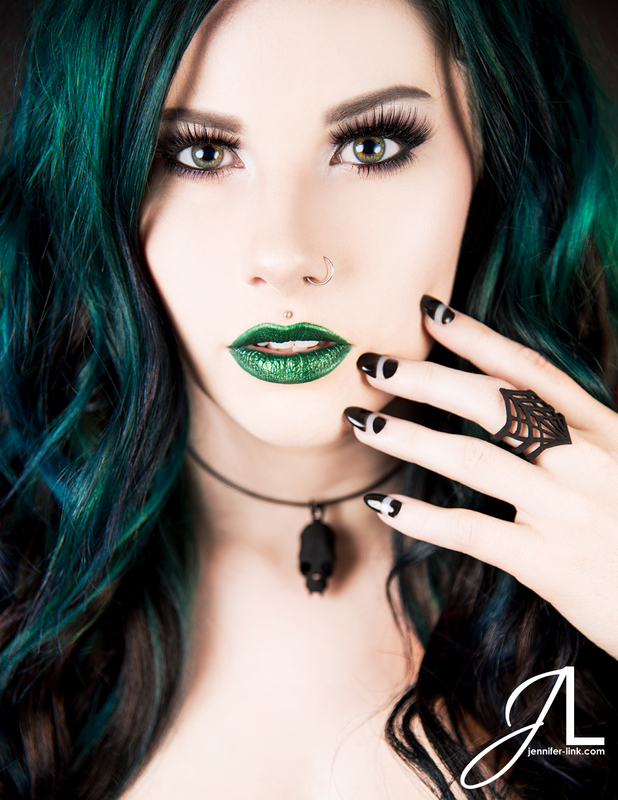 Big false lashes, striking green lips, and great nails give distinct points of visual and styling interest. We featured The Rogue + The Wolf’s Black Widow Ring. We have been excited to feature The Rogue + The Wolf several times since their start in 2012 including an early on Designer Spotlight in Auxiliary Magazine styled by our Fashion Editor at the time Pretty Deadly Stylz. This spiderweb ring is 3D printed from polyamide nylon plastic, it’s a pretty cool piece! Liked it so much I purchased one for my personal wardrobe. You can see more Must features I have photographed for Auxiliary Magazine in my other blogs for Must features.